3. With some no gym days we could also spare a little more than the average tummy space for some good food!! The Jamaica Epicurean Escape is an international food wine and music festival that creates a melting pot of international and Caribbean food, with popular and traditional Jamaican cuisine taking pride of place, all complemented by a variety of wine, beer and spirits, and featuring top class local and international musical performers. 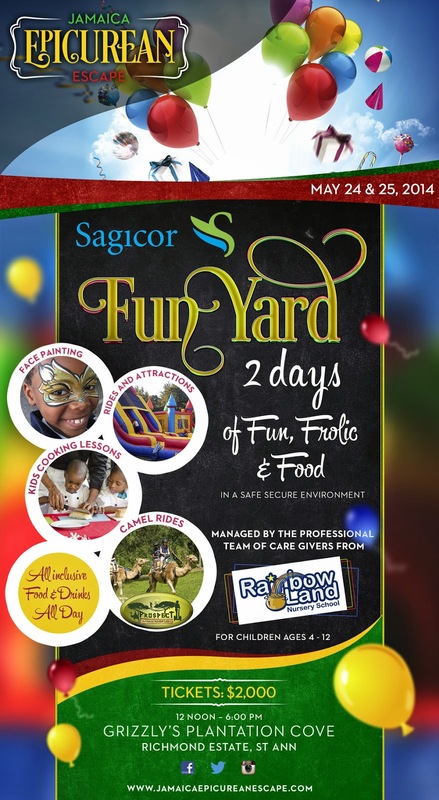 sounded awesomely delightful, but then we wondered if it was more like a Mommy and Daddy only kind of event UNTIL.. tada the Sagicor FunYard which promised 2 days of Fun, Frolic and Food FOR KIDS in a Secure environment managed by a professional team of caregivers. Can anyone say win?! We just have to show you the flier so you can understand why we got so excited. With 2 days of family frolic on the horizon, we could scarcely wait. Bags packed, hotel booked, checklist in, we were doing pretty great on getting what we wanted for the weekend and so the adventure began. Significant delays aside, we were greeted at the Grizzly Plantation Cove minutes after 5: 00 p.m by some late evening rain and with just a few minutes left before the scheduled closure of the food stations at 6:00 p.m. With J$1200 worth of taste tickets to start, we wanted to see how much food we could get (VIP Tickets gave just about unlimited access to the many food stations) and so we went foodie-ing. A quick look around revealed food stations way beyond what the eye could see. It was going to be a long day…. in Foodie heaven no less :-D. Half way in we discovered the Jewel Resorts Station was doling out non stop supplies of goodies a la: Crayfish & smoked chicken soup; Plantain Mash; Pork wraps and Pork Pull on coco bread. 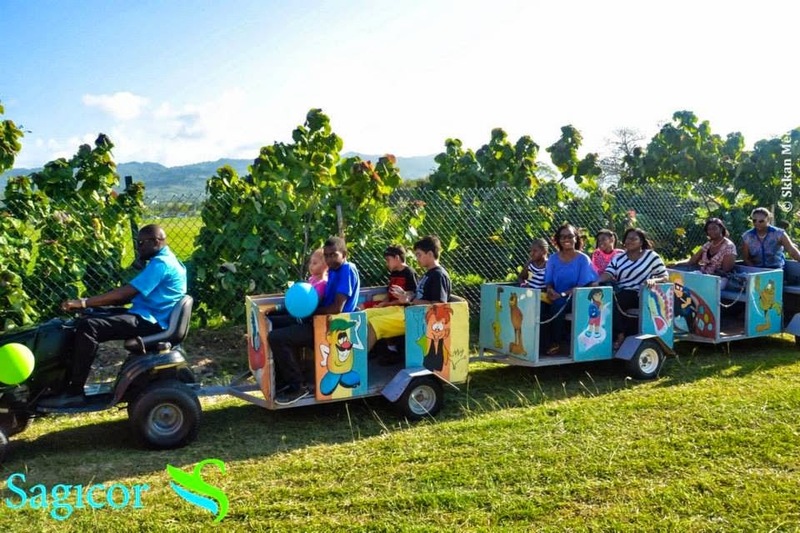 Several stops between those two stations and we did not get a chance to fully utilize our J$1200 worth of foodie taste tickets. For about J$300 worth of tickets a pop, we did get to enjoy some delightful duck breast with spaghetti from the UTECH tent, a trio of vegetarian delights at the Rasta Indigenous Village for J$250 and some Indian treats at the Mystic India food station for about J$300 as well as pop corn and snow cones for lil miss. 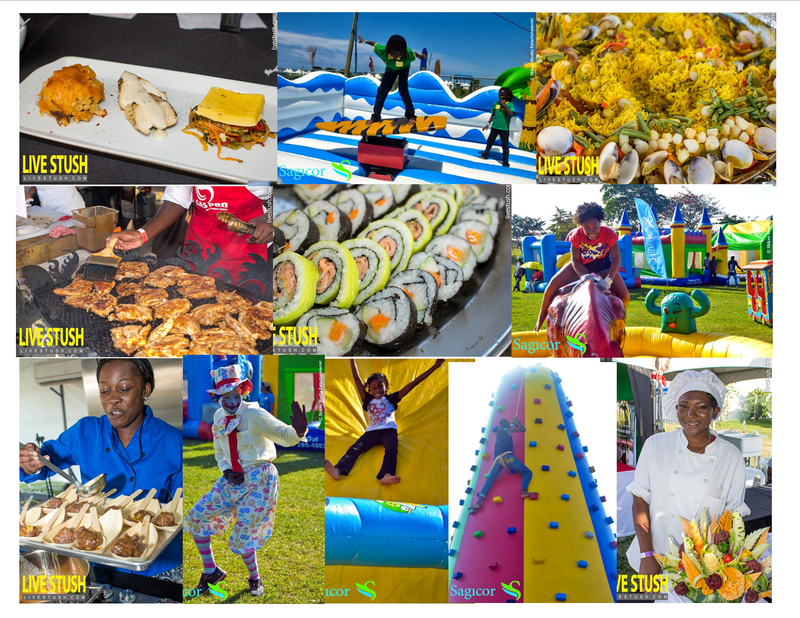 The food stations too were open well after 6:00 p.m much to our delight, so stuffed and Happy, we rounded off day one with the concert featuring Award Winning, International singer Melba Moore, Suzanne Couch, One Third, Rejaune Baptiste among others.. But what of the fun with our toddler you ask? Enter Day two! Determined to make up for time lost with our late start on Day 1, we arrived at the venue by midday. 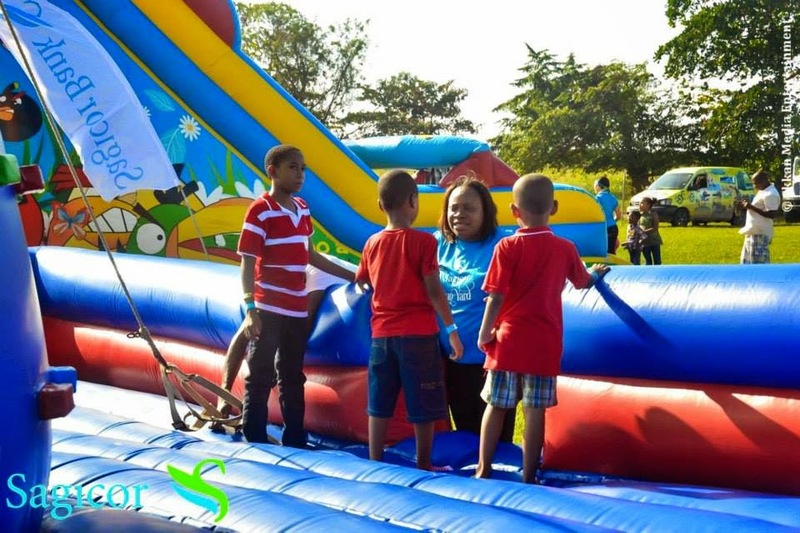 Hot sun aside, and a few quick bites later, we popped right over to the Sagicor FunYard- the place that promised an all inclusive food and fun affair for kids aged 4-12 years and boy was it what was promised and then some.. 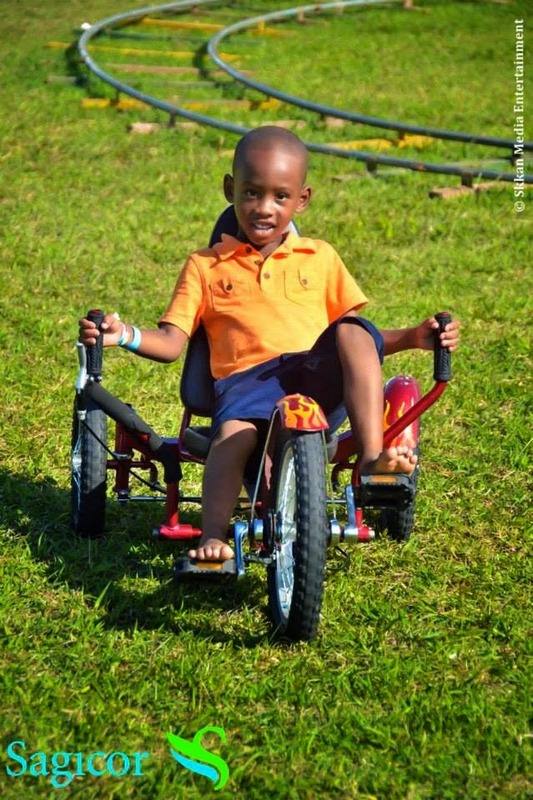 Imagine stepping in and as far as the eyes can see-rides of every sort: Bounce abouts, tricycles, rock climber, surfboard, train, merry go rounds, trampoline, sumo wrestler games, rodeo bull whew! There was also a thankfully very cool and windy activity centre complete with just about every game, face painting, balloon making and a TV with movies for the little ones. This was all topped off by kiddie foodie heaven featuring: Hot dogs, Burgers, Snow Cones, Cotton Candy, Popcorn, Juices and so much more. To say I got kid in a candy store kind of excited was an understatement. To say my toddler was in heaven- that too was an understatement. Containing myself enough, I asked these two lovely aunties about the process once the kids got in…. 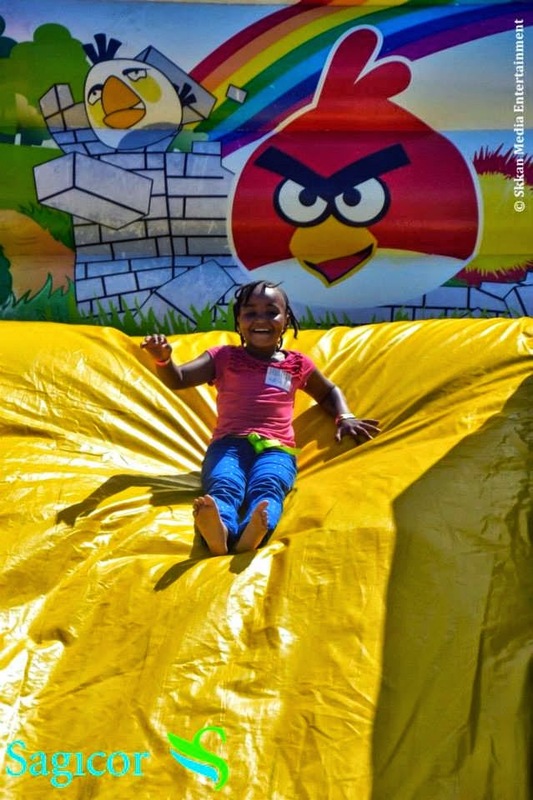 Immediately after, I just had to test out a few of the rides and decided not to show as I held on for dear life on the surfboard and that very steep angry birds slide 😀 Our little missy too did not bat an eye as we cleared the registration desk and left her to enjoy her kiddie chronicles. 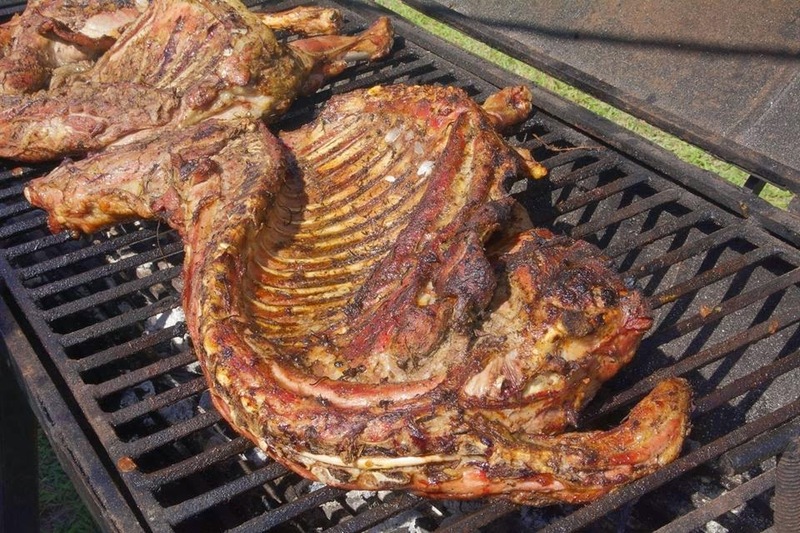 As the day wore on, we continued to sample a little bit of this, lots of that, went to a Foodie Seminar featuring several local and international chefs; had Mashed potato and oxtail served on an ice cream cone 🙂 Rode a Segway by the Prospect Outback Adventures station and had dessert and wine whenever we felt like it 😀 without having to worry about our little miss. The occassional checks showed that she was in the zone and just wanted to be left alone to enjoy this treat. In the end, we rounded off Day 2 with fruit sorbet and non dairy ice cream from the Debs non dairy products tent; grabbed some meals to go and headed back to Kingston Happy and Hearty. 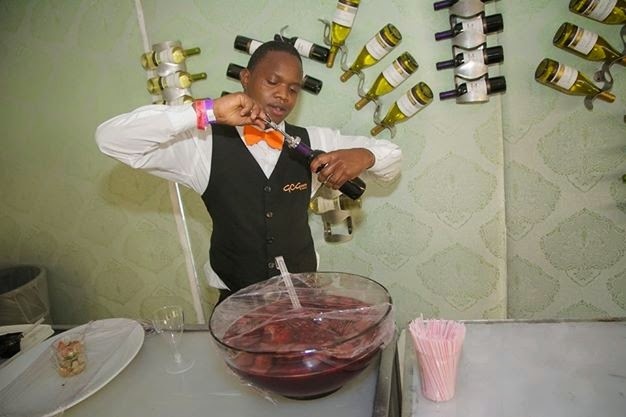 In a phrase, the Jamaica Epicurean Escape gave us variety galore. It gave us just the family getaway we wanted and heightened the experience for us with a very wide assortment of Food-sadly we could not possibly have tasted from all the food stations- yup it was THAT grand; we also got the frolic from the outdoor play for our little one to the many things that we as adults got to see and do and in the midst of all this post, you would have noted we definately got the fun!!! 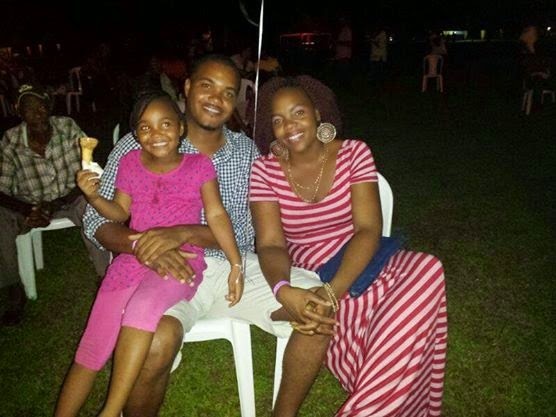 So the next time you are seeking that multi-sensory family adventure, take our word for it and pop on by to the Jamaica Epicurean Escape and who knows, maybe next year the organizers can introduce a family package to get more families out. 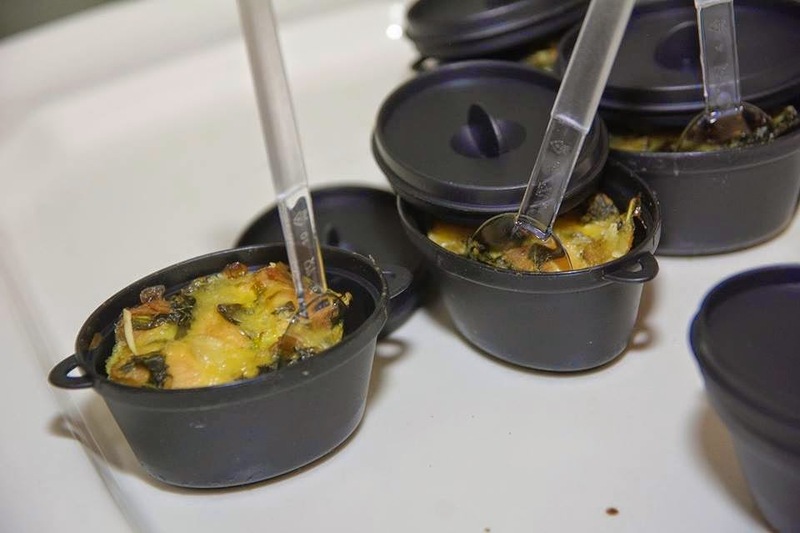 Did you pop by the Jamaican Epicurean Escape?! How was it for you?